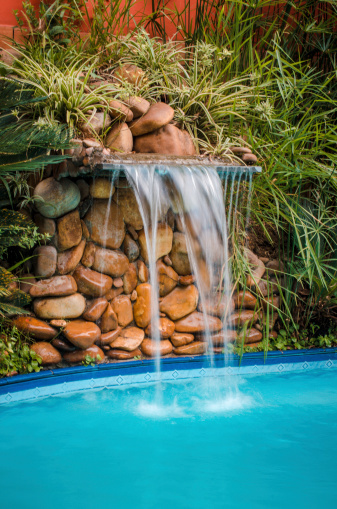 A built-in waterfall is only one of many swimming pool features we can offer to build your paradise. A swimming pool is a swimming pool. But a swimming pool from Paradise Pools, chock full of awesome and unique swimming pool features…well that’s paradise. Like we mentioned when we first introduced ourselves, a pool is just a centerpiece to a bigger and more exciting design project. Part of that can mean accessorizing your pool. Let’s talk about how we can help with that. When you think swimming pool features, water features are probably one of the first things that come to mind. The pool does already have hundreds upon hundreds of gallons water right there, waiting to be used, after all. So what kind of water features are we talkin’? Well, there’s the ultimate luxury of a waterfall. Let’s be honest — who doesn’t dream of having a gorgeous waterfall right in their own backyard? There are also fountains, the epitome of class. And for more kid-friendly swimming pool features, there’s always the classic, tried and true water slide. But don’t you go thinking that we install any boring ol’ straight water slide. Check out our water slides page for a list of the variety of designs we offer. 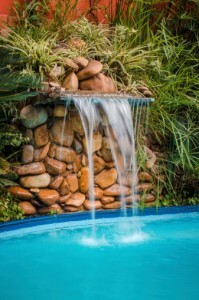 Contrary to the immediate thoughts of water features, we’ll bet fire is one of the last things to cross your mind when accessorizing your swimming pool. We told you, we have a knack for building one-of-a-kind paradises. Under our “Links” tab in the menu bar, you’ll find “Bobé Water & Fire Features.” If you click that link (or here for the sake of convenience), you’ll learn more about the stunning fire features that Bobé offers. This entry was posted on Wednesday, May 4th, 2016 at 3:45 pm. Both comments and pings are currently closed.